Before the industry was talking about hyperoxaluria or enzymes, our Captozyme team was busy researching, writing, and publishing our scientific breakthroughs. Using articles and white papers, we have shared our expertise with the world to help move the microbiome movement forward. Nephure™ is a proprietary oxalate decarboxylase (OxDC) enzyme being developed as a food ingredient. 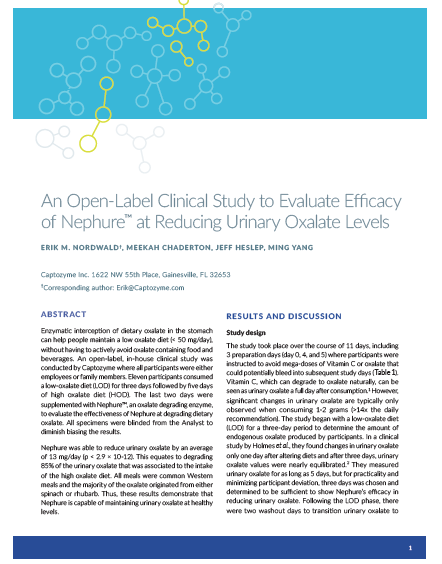 In this study, the safety of Nephure™ was evaluated in a bacterial mutagenicity assay and in a subchronic (13-week) oral toxicity study in rats. Nephure™ did not show any mutagenic properties in the mutagenicity assay. Enzymatic interception of dietary oxalate in the stomach can help people maintain a low oxalate diet, without having to actively avoid oxalate containing food and beverages. An open-label, in-house clinical study was conducted by Captozyme where all participants were either employees or family members committed to advancing the standard of care.